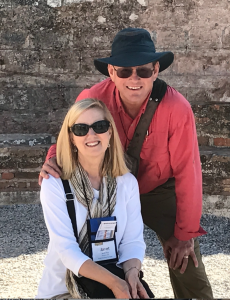 Steve and Janet Ray are the writers, producers and hosts of the Footprints of God video series. Steve is the author of five books, of which four are best selling books with Ignatius Press. He has a store on the internet. Steve also speaks around the world and is a guest on many radio and television programs. In 1982 they began touring Europe to research their Protestant Christian heritage; even smuggling Bibles, money and medicine behind the Iron Curtain before the Wall came down. As Evangelical Protestants they studied in Switzerland with Dr. Francis Schaeffer at L’Abri and spent a year touring and discovering the European roots of Western Civilization and the Christian faith. Two years later they again drove through 14 countries over two months in Europe learning and exploring. 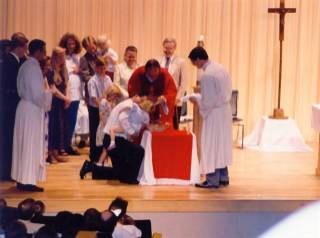 In 1994 the Rays with their four children converted from Evangelical Protestantism to the Catholic Church. They began research and exploration in the Middle East starting with their conversion to the Catholic Church in 1994. Since then they have visited the Middle East and Europe over 140 times exploring, writing and filming in Israel, the Palestinian territories, Egypt, Syria, Iraq, Jordan, Lebanon, Turkey, Greece, France, and Italy. So far they have completed eight of a projected ten-part documentary series: Abraham, Moses, David/Solomon, Mary, Jesus, Peter, Paul and Apostolic Fathers. The 8th film, Abraham: Father of Faith and Works, was filmed on location in Iraq, Israel and Turkey. They are filming Elijah and Elisha in 2017. In 1975 Steve started a family business and built it up to 800 employees with yearly sales of $12 million. In 2007 he sold the business to devote his life to biblical studies, writing, teaching, and guiding. 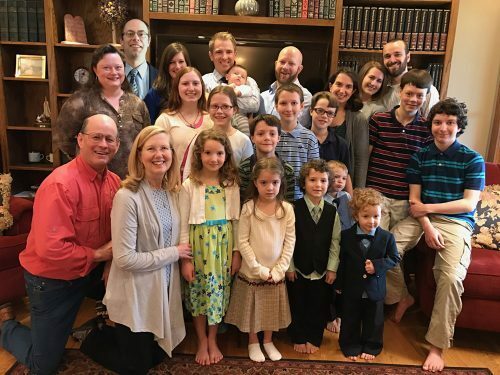 The Ray’s home-schooled their four children through High School. As of Christmas 2017 all their kids are graduated, married, and they now have thirteen grandchildren. 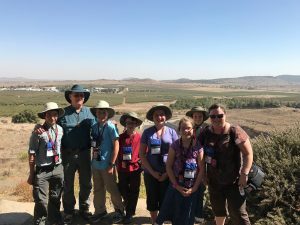 Guiding in Israel and beyond: Steve and Janet are expert guides to the Holy Sites in Israel and other biblical lands. They have guided thousands of people through Israel, Italy, Jordan, Egypt, Poland, Ireland, Mexico, Portugal-Spain-France and other locations important to the Catholic Faith. There is nothing they love more! Steve & Janet Ray have contracted Corporate Travel to arrange their pilgrimages and cruises – registration, flights, insurance, etc. John Hale of Corporate Travel is a fine man with a beautiful Catholic family. He and his team are great to work work with – professional, Catholic and helpful. Mark Slater is Operations Manager. He handles pricing, flight reservations, and other travel details. Elizabeth Markey and Kendall Karpack are the daily contacts for our pilgrims — they answer all the questions and assist with registration, insurance, dates, airlines and more. Cruises: Amy Chinns ABrewis@ctscentral.net or 800-727-1999, ext. 111.